This week's listening, wearing, making. . . Wearing. . . Here's where the title of this post comes in. 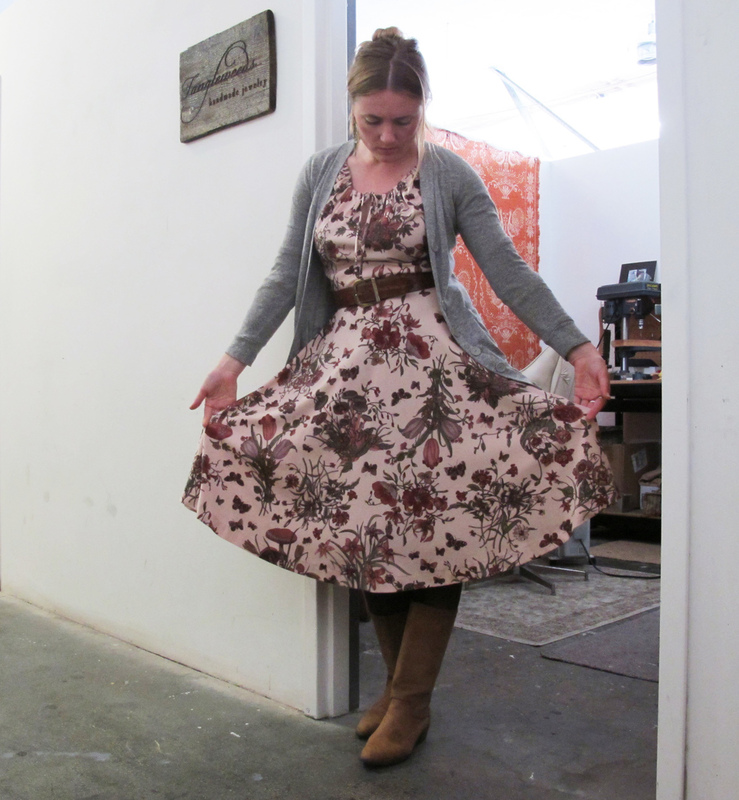 I got this dress for a mere three bucks at the Treasure Island Flea a couple of months ago. (Yes, I love to shop at the same events that I sell at!) This dress just seems like the perfect dress for a high school art teacher. And I've been told by a few friends that I dress like one. Which I take as a HUGE compliment of course =). Making. . . I think I've been saying this for the last few weeks, but I'm still mostly working on the new collection. That's going to change soon as I make the time to make more of my classics and build up my inventory stock for my many spring and summer craft fairs. Here's what will be my last sneak peek of the new collection until I release the look-book and put the items up in my Etsy shop. It's always hard to say which pieces are my favorites, but in this photo I'm loving the necklace on the far right and the earrings on the far left. Yesterday I finished taking all of the photos of the new pieces. Today I'm back in the studio. Tomorrow I'll be at the 25th Street Collective for Art Murmur in Oakland. A Tangleweeds trifecta of very different types of days! I hope everyone has a wonderful weekend. And don't forget to enter the Tangleweeds Giveaway if you haven't already!